289/FVF/IR3000 289 Multimeter with Software and Wireless Connectivity Kit.Zoom on trend provides unprecedented ability to view and analyze TrendCapture data; zoom in up to 14 times.Selectable AC filter (smoothing mode) helps display a steadier reading when the input signal is changing rapidly or noisy.100 mF capacitance range.Peak capture to record transients as fast as 250 s.Premium test leads and alligator clips included.Amp jack plugs included.Fluke 289/FVF/IR3000 289 Multimeter with Software and Wireless Connectivity KitNow compatible with Fluke Connect Mobile AppMaximize productivity with the combined Fluke 289 and FlukeView Forms Combo Kit. With built-in data logger and TrendCapture capability, the 289 helps you track down elusive, intermittent problems, monitoring equipment with any of its functions while you do other jobs. Using FlukeView Forms software allows you to overlay your logged data from six meters or six time periods to find cause and affect relationships or for condition monitoring. 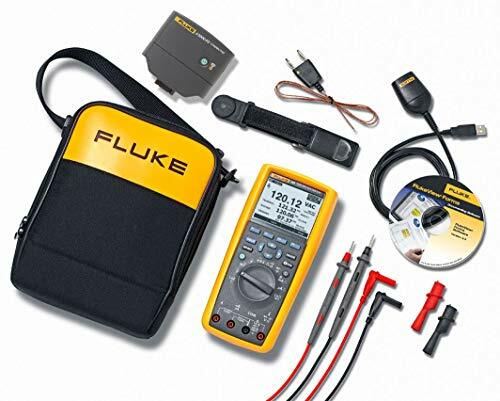 Turn your data into meaningful graphs and tables for a professional report or analyze individual readings or series of measurements.The 289 is compatible with the Fluke ir3000 FC Infrared Connector, allowing you to share live measurements on your iOS or Android smart device with the Fluke Connect mobile app. The 289/FVF combo kit gives you a practical and affordable approach to predictive maintenance.